Tim Randle of REIClub.com here. I want to let you in on a niche with superb CASH FLOW. Now, if flipping is your thing, this might not mesh with your personality or goals. But if you like consistent, dependable cash flow... And you don't like to deal with tenants... You owe it to yourself to consider this over-looked niche. Self Storage. Ever thought about it before? There are over 50,000 self storage properties in the US. It's been the fastest growing segment in commercial real estate over the past 25 years (which matches up with our ever increasing collection of 'stuff'). It's also the youngest commercial real estate sector only taking a foothold in the 1980's. And one more interesting statistic - it has the lowest loan default rate... no doubt due at least in part to the cash flow. Oh, and, demand is INCREASING. There isn't a huge crowd of investors that ever think about self storage. Nor is there a parade of 'gurus' teaching about it. But I've found three experts that know this niche SCIENTIFICALLY. Now you don't need to be a math whiz by any stretch because it's all simple math. But if you like things to dependably and predictably 'pencil out', you'll love this niche. "I can't think of 1 single long term trend in our country and our economy that doesn't benefit Self Storage - it's the perfect storm - a Hurricane of Profits. This is the sweetest spot in the whole American economy; a Receptacle for an enormous cascade of money! Opportunity resembles the oil industry in the 1950's or Silicon Valley in the 1990's!" Frank Rolfe started his commercial real estate career in 1982 selling billboards and later moved on to mobile home parks. As a billboard guy, Frank dealt with self storage facility owners for billboard placement. In the mobile home park niche, self storage sometimes was part of the property. And as Frank learned - a profitable part. Frank runs the second largest self storage website now as well as being an active investor in self storage and mobile home niches. "I recently ordered the interview series on Self-storage investing. I had no idea what self-storage investing was when I ordered, but I ordered the material anyway because self-storage investing offered the opportunity to generate substantial cash flows. I am so glad I ordered because what I received was very powerful, practical and in-depth information on the topic from three of the nation's top experts on self storage investing -- Frank Rolfe, Scott Meyers, and RK Kliebenstein. Each expert provided a slightly different perspective, but I personally liked Frank Rolfe's interview the best because as a new investor I felt I could relate to his advice the most. But all three experts provided a wealth of information on everything related to self-storage including what it is, how to learn more about self storage, how to find propoerties, how to analyze the deals, how to get financing, and how to manage a self-storage facility. Armed with all this knowledge, I got really excited about the opportunity and using the resources mentioned in the materials, I was able to find a property for sale in my area which is a good deal and fits within my investment budget. It is for sale because the current owners are not doing a good job of managing the property, which I feel I will be able to change using what I learned from the interview series. I have ordered the financial data from the sellers, I am getting quotes on getting the property inspected, I am talking to my private money lending partners, and am getting ready to talk to my bank. At the same time, I am also ordering more material to arm myself with more knowledge about self-storage investing. Thank you REIClub for introducing me to this great opportunity and please tell me about other interview series that I could take advantage of." 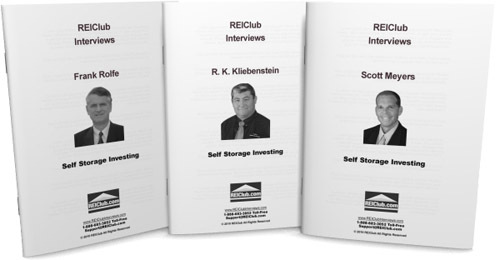 "I recently purchased the self storage interview series with Scott Meyers, R.K. Kliebenstein, and Frank Rolfe. I liked the fact that it came with an audio and written copies of the interviews as well as the abridged nuggets of gold. As I am learning about self storage, I seek the best advice and I feel this information was quite useful for a novice investor like myself. Also, I was pleasantly surprised that the interviewees provided their contact information in case I wanted to reach out to them. Overall, I am quite pleased with this mini course." RK Kliebenstein lives and breathes self storage. He's a national industry speaker, award-winning author, and expert witness in acquiring, developing, managing and financing self storage properties. RK has been involved in nearly 5,000 self storage property transactions across the US. He's been a part of underwriting nearly $2 Billion and has closed nearly $700 Million in self storage transactions. RK started in multi-family and office buildings. An investor whose portfolio he was managing in Albuquerque discovered 'mini-storage' while vacationing in Arizona. His command: RK you need to figure out how to become a mini-storage expert. RK did just that... on a grand scale. "I recently read the interviews of Frank Rolfe, Scott Meyers, and R.K. Kliebenstein. I found the information very helpful. Each one of these guys gave insight on different aspects of the self storage business. I have been investing in R.E. for almost 5 years. Unfortunately, I have wasted too much money on expensive "systems" the gurus have claimed to be "all inclusive" - only to find out that there was no new information - just a fancy package. However, I still believe in consantly educating myself, and I figured that I would purchase these interviews because they were affordable...... a lot less than $1,000. I got more information out of these three interviews, than I did on the last $1,000 that I spent on a guru's nicely packaged course. I think that self storage can be a very rewarding niche to invest in, but I also believe that it can be difficult to get started in. I think that the information given on these three interviews will save me a lot of time and costly mistakes." "I recently purchased the interview series on self-storage on REIClub.com. The interviews are all unique and interesting, as well as filled with industry standards and rules of thumb that are sure to keep new investors from making huge mistakes. For example, in the interview with Frank Rolfe he mentions a few key metrics when discussing market selection which make the process very easy. If you are able to find a market that meets his criteria, you are starting the investment process in a very good position in terms of supply/demand. Real estate can be an incredible tool to build wealth if you know how to avoid the major potholes. Sources like the REIClub make investors knowledgable so they know what to do and what to stay away from." Scott Meyers started his real estate investor career as many do, with single family residences. He expanded to apartment buildings and with a large rental portfolio got into some cash flow problems when market conditions changed in the 90's. He stumbled onto self storage and was delighted to have steady cash flow without tenants and toilets. Self storage is his single focus these days. He now owns about 3,000 units and is expanding as fast as he can. Scott has found a niche within the niche and two different ways to optimize this segment that most self storage operators haven't implemented (or even know about). 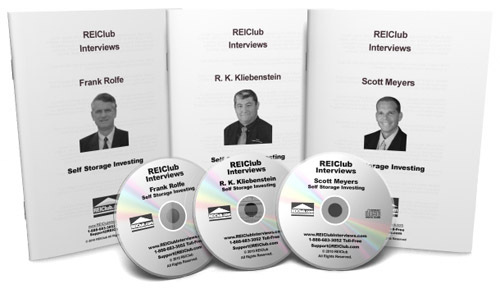 "I recently purchased the self storage interview series with Scott, R.K., and Frank. I appreciated that I as a consumer could have the option to download a written copy of the interview... download an audio/video version... or simply get the nuggets of the interview. It is nice to have choices, and people learn in different ways. I bought the interviews because I am considering self storage real estate as a source of additional income during retirement in a few years. The information was helpful to a self-storage novice like myself. I especially appreciated that the interviewees gave their contact information for follow up if I need additional information. Thanks so much." These strategy and tactic-dense interviews from experts with solid track records will come to you in a 3-CD set... listen from your computer, your car, your portable mp3 player or wherever. I carefully prepare for each interview. I probe deep on the important aspects and keep each guest focused and on track. The quality of the content is as good or better than private seminars. But the most powerful way to make something second nature, to fully integrate powerful, profit-making ideas into your brain, so you can recall them on command, is to use multiple senses to digest the information. You'll have the transcripts to read along with, scan and skip through, study and markup with notes to easily review when you need that clarification or re-introduction. THAT'S why I went through the extra time and expense of having each interview professionally transcribed. Sit back and watch as Scott lays out - point by point - the opportunity in self storage, where the industry is, where the industry is going and what are the biggest trends going forward. You'll also get an inside look into his business and see a couple of technology tweaks he's implemented that make his facilities operational around the clock without employees. "The Self-Storage Interviews" makes an excellent addition to any investor's real estate library. Whether they are a seasoned Self-Storage Investor or one that is new to the industry, the interviews offer something for everyone. Each interview and videos served to re-confirm the methods of investing in Self-Storage that I am already participating in and we both are headed in the same direction. Scott Meyer's 4 videos are a course in themselves, providing so much information that a new investor will learn a great deal on the Self-Storage Industry that they were unaware of before, and the seasoned investor can use the videos to sharpen their networking skills and verbiage in putting proposals together. It is quite refreshing to see that Frank Rolfe, Scott Meyers and R.K. Kliebenstein, did not forget how they felt when they first started in Self-Storage, and are now putting their contact information out there for students to contact them if they need advise with a Self-Storage purchase. This certainly was money well spent!" "Frank Rolfe - I was so impressed with the knowledge and guidance what he has given about investing in self-storage. Good information for those who want to learn how to take your investment to the next level. Frank makes many marvelous points, the first being that the criteria to choose only facilities that are well located, how to find properties, facility classifications, good, bad, ugly, and how to analyze deals, comparing the smaller facility with a larger one and how the financing work. His interviews about industry generation facilities help us to find what kind of self-storage we are looking. His materials give more detailed information how to analyze deals. Also learning that there are many ways of financing deals has enlightened me as well. His interview includes all the information that we need to find how is the acquisition of the self-storage works. It can benefit everyone the points set forth in the presentation. He clearly makes us understand what are the challenges and triumphs in the industry. Whereas in Scott Meyers presentation not talking much about what are the challenges in the industry. I think this was just exactly what I need in order to gain more financial knowledge about self-storage. The information wasn't I wanted to hear but he always make it clear and interesting. He also did an enormous amount of interest to determine macro side of the self-storage facilities. Scott Meyers - His information is very informative and a step by step guide to building an ever increasing portfolio of self-storage facilities. He guides you through the investment process of self-storage while also giving more tips how to invest in other commercial properties. A lot about on how to evaluate self-storage facilities. He provides an in depth information about how to increase the intrinsic value, how to calculate Cap rate, expense ratio, net operating income etc. His recipe gives you an easy to understand formula to get started. He teaches you all the information you need to buy, finance and manage self-storages. He also gives information about how to use kiosk to operate the facility 24 hours a day. He believes that self-storage investments are superior investments compared to other commercial properties. They are easier to finance through community banks, credit unions an S&Ls. His buy and hold method make sense but the idea of buying something, fixing it up and then create value by increasing rents is probably not going to be an easy task. That said his information has a lot more useful techniques in it than most other real estate Gurus. R.K Klienbenstein - R.K's informations put it all into perspective for understanding exactly what is involved in investing self-storage industry. His information is a comprehensive guide to investing in self storage. He provides information about how to analyze deals and execute it. He advocates an analytical approach to finding the best location to acquire the self-storage. He discusses in great detail about buying smaller facilities and larger facilities which have diminishing returns because it's difficult to maintain a high occupancy. He also uses real life examples to help the investors better understand the principles he teaches. R.K's insights are extremely helpful to both beginners and matured investors. He provides the tools for success that are essential for anyone interested in investing self-storage."